Editor’s Note: This is the second in a two-part look at Kevin Hanlon’s documentary Bill W. In yesterday’s installment, biographer Matthew J. Raphael recounted his own experiences trying to capture and contextualize the life of AA’s co-founder for the book Bill W. and Mr. Wilson. Bill W., an excellent new film from 124 Productions, takes a qualitative quantum leap over My Name Is Bill W. (1989), an ABC made-for-television movie starring James Woods as Bill Wilson and James Garner as Dr. Bob Smith. Bill W.’s widow, Lois Wilson, lived just long enough to read and approve that script, and the lead performances, especially Woods’s, are convincing. But as Norman K. Denzin asserts in Hollywood Shot by Shot: Alcoholism in American Cinema (1991), the fusion of Bill W.’s life with the “origin myth” of AA makes this film “a piece of official A.A. ideology that reproduces this organization’s version of its place in American society.” In effect, it employs biography as a means to place Wilson and AA alike “outside history, politics, and power.” What I referred to yesterday as “the bedtime story” becomes an agreeable fairy tale for the New Agey Twelve-Step Recovery communities of the 1980s and 1990s. 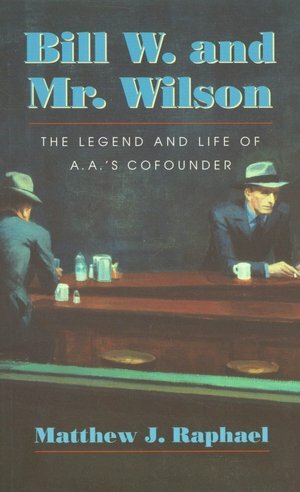 Bill W., by contrast, connects Wilson directly to the history, politics, and power that bore on his life both inside AA and, to a lesser degree, in the outside world. The film takes account of such social conditions as the Great Depression, the shady new devices (some invented by Wilson) for boosting Wall Street profits, the gaudy excesses of the 1920s, in which Wilson eagerly participated, and the stark racial divisions that Bill W. finessed by encouraging “separate but equal” meetings in the South. The overall treatment of race, however, seems a bit underdeveloped and thus slightly evasive. Only one of the shadow-enshrouded AA members interviewed for the film is African American – a detail viewers might fail to recognize if he did not (at the director’s prompting?) move his tell-tale black hand into the light. The film gives a brief depiction of the Bowery as the ultimate hell-hole into which alcoholics can fall. But while the context suggests white alcoholics, the illustrative old photographs show only black down-and-outers. Still, only a zealot of political correctness would find much fault here. The film begins and ends with poignant footage of Bill Wilson in old age, taking his accustomed walk from the main house on his suburban property, Stepping Stones, to his hand-built study, dubbed Wit’s End. The narrative proper kicks in with Bill’s taped performance of his story — as recreated by an actor before a large and festive make-believe AA meeting. The scene is historically creditable. We see intent faces trained on the spellbinding speaker. We hear waves of knowing laughter, with the sardonic edge characteristic of AA humor. We can almost smell the smoke ascending from one guy’s cigarette! We note that the audience is predominantly white, middle-class, and male. There are also women present, perhaps in greater numbers than they actually were at the time; as expected, there’s not a dark face in sight. The tape, which is occasionally shown spooling, to remind us of what we are hearing, provides the spine of the film until its chronological limits are reached. 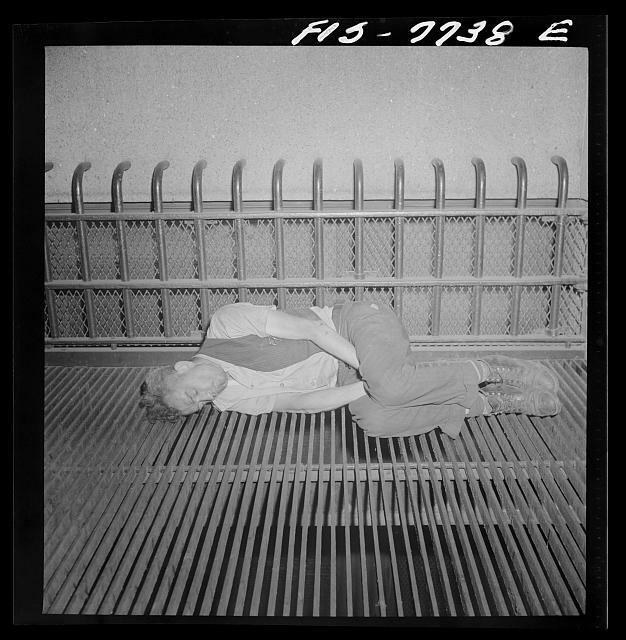 Thereafter the narrative takes its forward momentum from supplementary visual and audio materials, which encompass the years up to Wilson’s death on January 26, 1971. The visual substance comprises a mixture of the recurrent meeting sequence and other enacted scenes, along with period photographs and film, including pictures of Bill that I, at least, had never seen before; shots on background of the Wilsons’ residences, particularly Stepping Stones, and of other important locations; some key AA documents, overwritten by viewer-friendly subtitles, which also accompany some of Wilson ‘s blurrier voice recordings; the testimony of a few AA members (filmed in shadow, as I’ve indicated, to preserve their anonymity); and interspersed interviews with several talking heads, all of them experts on Bill W. and AA, whose recollections and opinions are invariably cogent, informative, and engrossing. I’ve never seen better editing of this format; it plays as if we hear every word that counts and not a word more. The same goes in general for the film: not a wasted frame. Unlike the canonical representations of Bill W., this film faces up fairly and squarely to the most controversial aspects of his career – although it omits mention of Bill’s scandalous flirtation with Roman Catholicism. One of these was Bill’s infatuation with LSD, which he took for five years as an aid to spiritual enlightenment. Later he beat the drum for vitamin B-3 as a potential cure for the harrowing depressions that ravaged him and other alcoholics. Official AA had neither interest in nor patience with these heretical deviations from its primary purpose. More sensitive was the older Wilson’s all too public love affair with Helen Wynn, an alcoholic former actress and a fellow victim of depression, with whom he shared what was likely the most intimate relationship he ever experienced. “I think she saved his life,” said Nell Wing, Bill’s longtime assistant and right-hand woman. Lois must have known; for her own reasons she tolerated the situation, no matter how it pained her. With both of these matters, the film adduces the crucial evidence and strikes a balance between approval and disfavor. The final uproar concerns Wilson’s deathbed demand for a drink, which Lois staunchly rejected. The film reminds us that Bill, a heavy smoker, was suffering from emphysema and drifting in and out of delirium from lack of oxygen. Who knows if he really meant it? Because the production values of this film are so impressive (with a single exception), they deserve special credit. A couple of examples: the creatively purposeful way the opening title is shown first as Bill Wilson and then dissolves into Bill W.; the effective framing and presentation of documents, with subtitles at just the right places; the striking use of music. Besides an original score, we hear subtly mood-matched snatches of classical music: the Romantic piano of Beethoven, Schubert, Chopin; but mainly excepts from Bach’s astringent Sonatas for Solo Cello, as interpreted by Yo Yo Ma. The unfortunate exception: the sound track is annoyingly out of synch when the talking heads are talking. The documentary style of Bill W. recalls the heralded and distinctive work of Ken Burns, and it merits the widest possible exposure, whether on public television or in open AA meetings or at AA conventions, such as the annual Founders’ Day in Akron, which commemorates Dr. Bob’s last drink and thus the official inception of Alcoholics Anonymous. It might be worth noting that, when I saw the film, I did not encounter any synch-sound issues with the talking heads (or anywhere else). I suspect that might have been idiosyncratic to the venue/technology at your screening. This is the third Points Blog entry about this film so far, and I think in the interest of a broader historical perspective, that I repeat a quote I posted earlier about an intention the co-directors/producers had for the film. Early on in the film’s production, the makers decided on an important motivation towards the creation of their final version. Here’s a quote from Jackson Truax’s interview with the two co-directors and co-producers published on May 16, 2012, on the Living In Cinema website. To me, without having seen the film yet, this early intention of the filmmakers suggests “Bill W.” is part of the decades old promotion of AA without questions as to its efficacy, because the quote implies the filmmakers assumed from the outset that AA gave good results to more people than it gave bad results to. I understand that documentaries are the state of the art in selective historical enlightenment. It reminds me in regards to best-tactics-available what was the WCTU’s long-standing “Scientific” Temperance movement overlaid upon society about sixty years earlier than the AA movement. With all this in mind, I’m looking forward to viewing the documentary. This point is very well taken. In light of it, I would have been more accurate had I said that while the film complicates the official line on Bill W. himself, it does not speak to its own premise: that AA works (as if it doesn’t in many cases). My book takes up the historical context of AA, and I have earlier stuck some pins in AA balloons in “The Twelve Myths of Alcoholics Anonymous” (2004), number 3 of which is: “AA is unique and unprecedented — the single key to sobriety. Other methods simply do not work as well, if at all.” (See Alcohol and Drugs History Society: ADHS@LISTSERV.MUO.EDU I would say, however, that the Twelfth Step intentions of the film do not invalidate its content, as far as it goes. In the 1930’s it was essential for “alcoholism” to be perceived as a white, middle class, affliction and not a condition of winos (i.e. Irish) in the Bowery and colored people in the slums. So the depiction of AA as a primarily white, middle-class organization is historically correct. That’s the way the activists in the “alcoholism movement” wanted it to be portrayed. The shift of problem drinking from the lower and working class to the middle and upper middle class during the 1920’s and 1930’s was a major factor in the popular acceptance of the medical model and the ultimate success of Alcoholics Anonymous.. I feel honored just to be read by Bruce H. Johnson, on whose work I relied heavily, as must any historian of AA. This is interesting, because it sounds so similar to the Sons of Temperance purpose almost a century earlier to cater to the newly citified mechanics and other wage earning classes. The more I learn, the more I see AA is a good bit more similar to the Sons than to the Washingtonians.